Our challenge today on Creative Belli is to use something non paper. I dug around in the drawers and found this mesh. 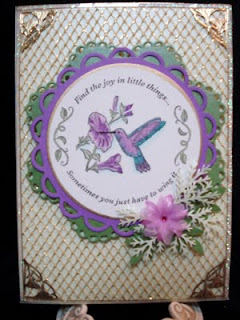 The stamps are from Just Right backyard bird set. The die cuts are Marianne Designs. Some gold peel offs and prima flowers with a MS leaf and fern punch. Copics to color the image and flower with. My DT sisters are listed to the right of this entry so please check out their fabulous creations!! Beautiful card- I love the gold mesh- it adds such a stunning effect to your card! I love the die cute and the flower embellishment too. Karen, love the mesh idea. Great Marianne dies and love the fern and branches by MS. I think Justrite Stamps are fab! BE-AU-TI-FUL card! Love the mesh idea! Would have never thought of that!! And the colors are gorgeous! You flower spray is beautiful also. Would love a tutorial on the mesh technique!!!! beautiful Karen!!! LOVE the mesh, so elegant! i just love the corners on this! i love how you use your punches. That gold mesh is fab, Karen. Wonderful job!